The Research Administrators' Campus Committee (RACC) will serve to represent the best interests of the faculty and departments involved in research administration on campus by fostering open collaboration and a sharing of ideas, concerns, progress and expertise. The RACC membership: Bottom row from left to right, Terry Novorr, Bill Dominguez, Kathy Kawamura, Dawn Zelmanowitz, Mary Ann Macaso; Top row from left to right, Keith Steele, Dion Baybridge, Annette Klufas, Mark Lucas, Shannon McGarry, Raellen Man, Lana Song, Duy Dang. Those who have the support of their department to fulfill the time commitment to RACC activities and sub-committees. As like with most finished products we experience in life, the beginning of the RACC did not have the intentions of being the entity we know it as today. 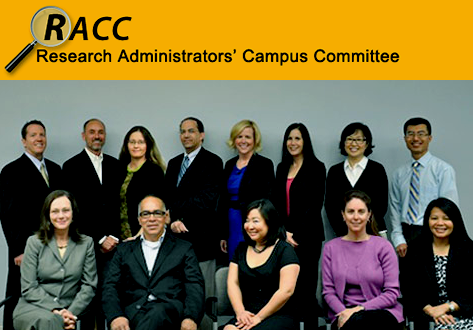 Currently, the RACC is known as a committee that represents the interests of departmental research faculty and staff and interacts with central offices such as the Office of Research Administration to ensure that new policies and products introduced to the campus have been reviewed and tested to attain feasibility and practicality throughout the campus. The RACC is also a driving force to educate the community about some of the cutting-edge research that is being conducted on campus in terms that the lay person can understand (BioBasics seminars). To say that the original goal and vision was to be as pervasive as it has become today would be unimaginable. In 2006 upon the appointment of James (Rick) Greenwood as Assistant Vice Chancellor for Research, the then Chairman of Pediatrics Edward McCabe along with Keith Steele, current Director of Finance & Research for the Departments of Pediatrics, Family Medicine and Human Genetics decided to meet to discuss the possibility of having some of our concerns heard over the recent implementation of the TIF expenses along with the need for better communication between the campus research community and central offices such as the Office of Research Administration. What was determined is that we hold a town hall meeting, but before we did that Dr. Greenwood asked Mr. Steele to get together with a few of his colleagues to discuss some of the topics that would benefit the campus and submit them to him. Upon this request, Mr. Steele determined that communication even at the level of research administrators on campus was lacking. So with much determination and many phone calls, the formation of this town hall committee was formed. In the coming months the committee was meeting with Dr. Greenwood regularly and because many of the issues were resolved through these meetings, it was determined that the town hall meeting was not necessary. What was necessary was that the “town hall” committee continue to grow and represent all areas on the campus and continue to be a unified voice and pulse of the departmental research community. Today we represent the majority of the UCLA Campus research portfolio with members throughout our University. What started out as a loose collaborative mission of setting topics for a town hall meeting has evolved into the committee we have today. Some have called us a grass roots movement, but we simply have the goal of serving as a conduit for anything and everything involving research administration at UCLA. The Research Administrators Campus Committee offers the opportunity for Fund Managers throughout UCLA to receive hands on training regarding 16 critical topics for Research Administration. Following is the Summer/Fall 2012 Weekly Fund Manager Training Schedule and Registration Form. Should you have any questions regarding these training sessions, please contact Raellen Man via email at rman@mednet.ucla.edu or by phone at x. 58112.